Ethnographic and archaeological records feature a rich body of data suggesting that understandings of the mineral world are in fact both culturally variable and highly diverse. 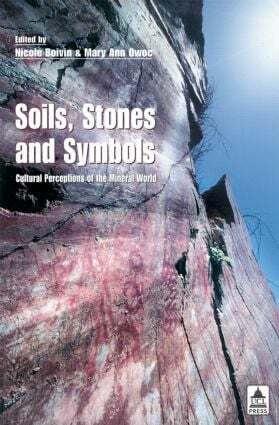 Soils, Stones and Symbols highlights studies from the fields of anthropology, archaeology and philosophy that demonstrate that not all individuals and societies view minerals as commodities to be exploited for economic gain, or as passive objects of disembodied scientific enquiry. In visiting such diverse contexts as contemporary India, colonial-period Australia and prehistoric Europe and the Americas, the papers in this volume demonstrate that in pre-industrial societies, minerals are often symbolically meaningful, ritually powerful, and deeply interwoven into not just economic and material, but also social, cosmological, mythical, spiritual and philosophical aspects of life. In addressing the theme of the mineral world, this book is not only unique within the social and geo-sciences, but also at the forefront of recent attempts to demonstrate the importance of materiality to processes of human cognition and sociality. It draws upon theoretical developments relating to meaning, experience, the body, and material culture to demonstrate that studies of rock art, landscapes, architecture, technology and resource use are all linked through the minerals that constantly surround us and are the focus of our never-ending attempts to understand and transform them.